The SxA250 sets a new standard for powered speakers. Its design provides the user multiple inputs with mix capability, an easy to use EQ section, and plenty of power in a very compact, attractive package. 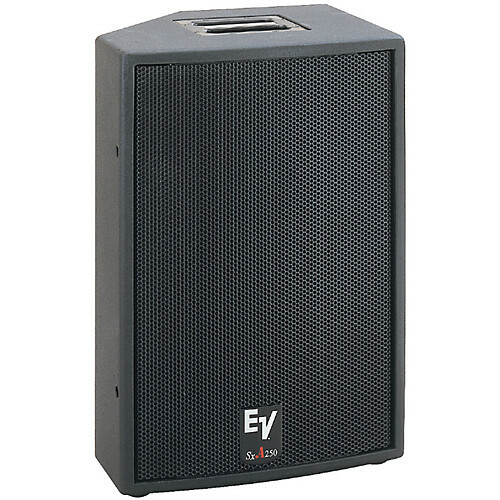 This is a full range loudspeaker ideal for applications requiring high-quality sound. Careful attention to the dynamic requirements of music guided the amplifier design to provide high SPL. The high quality microphone preamplifier provides great sounding vocals or speech. A master level control sets the desired SPL, and the line input can be mixed and balanced with a microphone with its level control. Its linear response is easily optimized for speech or music with the on board multiband equalization.